State space methods have proven indispensable in neural data analysis. However, common methods for performing inference in state-space models with non-Gaussian observations rely on certain approximations which are not always accurate. Here we review direct optimization methods that avoid these approximations, but that nonetheless retain the computational efficiency of the approximate methods. We discuss a variety of examples, applying these direct optimization techniques to problems in spike train smoothing, stimulus decoding, parameter estimation, and inference of synaptic properties. Along the way, we point out connections to some related standard statistical methods, including spline smoothing and isotonic regression. Finally, we note that the computational methods reviewed here do not in fact depend on the state-space setting at all; instead, the key property we are exploiting involves the bandedness of certain matrices. We close by discussing some applications of this more general point of view, including Markov chain Monte Carlo methods for neural decoding and efficient estimation of spatially-varying firing rates. We thank J. Pillow for sharing the data used in Figs. 2 and 5, G. Czanner for sharing the data used in Fig. 6, and B. Babadi and Q. Huys for many helpful discussions. LP is supported by NIH grant R01 EY018003, an NSF CAREER award, and a McKnight Scholar award; YA by a Patterson Trust Postdoctoral Fellowship; DGF by the Gulbenkian PhD Program in Computational Biology, Fundacao para a Ciencia e Tecnologia PhD Grant ref. SFRH / BD / 33202 / 2007; SK by NIH grants R01 MH064537, R01 EB005847 and R01 NS050256; JV by NIDCD DC00109. Koyama, S., & Paninski, L. (2009). Efficient computation of the maximum a posteriori path and parameter estimation in integrate-and-fire and more general state-space models. 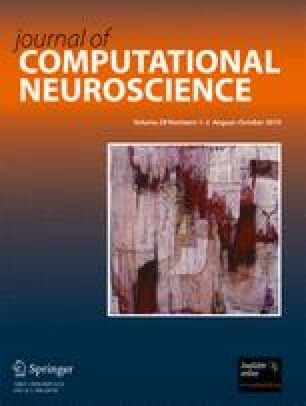 Journal of Computational Neuroscience doi: 10.1007/s10827-009-0150-x. Vogelstein, J., Watson, B., Packer, A., Jedynak, B., Yuste, R., & Paninski, L., (2009). Model-based optimal inference of spike times and calcium dynamics given noisy and intermittent calcium-fluorescence imaging. Biophysical Journal. http://www.stat.columbia.edu/liam/research/abstracts/vogelsteinbj08-abs.html.